The Volcano vaporizers by Storz & Bickel are among the best desktop vapes that you can get today. Here we take a look at the Volcano Digit, the digital version of the Volcano. Does it live up to the hype? Storz & Bickel, makers of the renowned Volcano desktop vaporizers, have quite a reputation among cannabis users. Considered by many as one of the best desktop vaporizers on the market, the Volcano can be found in dispensaries, coffeeshops, and at times, even in hospitals. Volcano was also the first vaporizer approved by Health Canada for medicinal cannabis users. In this review, we take a look at Volcano Digit, the digital version of the Volcano vaporizer. There are two versions of the Volcano—Volcano Classic and Volcano Digit. While the two are not much different when it comes to general usage and vaping performance, some features of Volcano Digit can make it an attractive option, particularly for expert vapers. First and foremost, Volcano Digit is more precise. The digital temperature control of Volcano Digit allows you to input your exact vaping temperatures, so you can set the unit to your desired heat level according to your preferences. You can then see the unit’s current temperature on the large LCD display. What’s more, Volcano Digit also has a 30-minute auto-shut-off feature, so you won’t forget to turn your vaporizer off ever again. VOLCANO DIGIT—HOW DOES IT WORK? Volcano vaporizers are designed as high-quality desktop vapes that you plug in. Just like the Classic, Volcano Digit requires that you fill the balloon with hot air. The air from the balloon is then passed into the herb chamber. There are two distinct valves that can be attached to the bag—the Solid Valve and the Easy Valve. The Solid Valve is made from stainless steel and heat-resistant plastic and offers customisable balloon sizes. The Solid Valve needs to be cleaned, but then it can save you money on balloons. The Easy Valve, on the other hand, works with one single balloon size but doesn’t require any cleaning. The Easy Valve can save you time, but then you may need more balloons. So you see, each of these valve types has their own advantages and disadvantages. If you don’t mind cleaning in exchange for cheaper recurring costs, go with the Solid Valve; otherwise, Easy Valve can be the way to go. Ultimately, it comes down to your preference. Volcano vaporizers didn’t get their good rep for nothing. Both variants offer very good performance, with a very intense vape for some massive clouds and incredible flavour. There is just no comparison to a portable vape when you use top desktop vaporizers like the Volcanos. Volcano vapes utilise convection heating, which means they don’t combust (aka burn) your herbs. Since there is no combustion and no smoke, this means there will also be less unwanted and potentially harmful substances in the vape. If you’re just starting out with a Volcano vaporizer, or you happen to like lighter clouds, it can be a good idea to start with lower temperatures. You can then always gradually work your way up some degrees each time until you achieve the best vaping experience. HOW EASY IS THE VOLCANO TO USE? Among the selling points of the Volcanos, besides their great performance, is the ease of usage. The digital temperature control of Volcano Digit couldn’t be any more straightforward. There are two large buttons that you can press to increase or decrease your desired temperature. Once set, Volcano will reach the temperature in about 3–5 minutes. It's not super-fast, but still tolerable. Maintenance of the Volcano is also easy. With the included brush, you can easily clean the filling chamber. Volcano also comes with two screens and an air filter that you can replace when needed. Volcanos are among the sturdiest desktop vaporizers that you can get. They are made from high-quality materials so they’re also quite heavy. Volcano Digit has a base diameter of about 20cm and weighs an impressive 1.85kg. It sits very stable on your desk or any type of surface, and there is little chance that it may accidentally fall down. We already mentioned that setting your desired vaporizing temperature with the Digit is very easy. But Volcano Digit has yet another advantage compared to the Classic: its wider temperature range. It goes from 40–230°C (104–446°F), while the Classic only goes as low as 130°C (266°F). This can be useful if you have material that you want to vape at exceptionally low temperatures. If you want a reliable desktop vaporizer with top performance, you can’t go wrong with Volcano Digit. There are simply not many other vaporizers that can offer so much when it comes to quality, reliability, and most importantly, vaporizing performance. Whether the slightly higher cost of Volcano Digit is worth it over Volcano Classic is something you will need to decide for yourself. We think that the added convenience of being able to set your exact vaping temperature, the LCD display, as well as the shut-off feature of the Volcano Digit may well be worth it. Then again, both Volcanos are excellent, and you can’t go wrong with either of them. 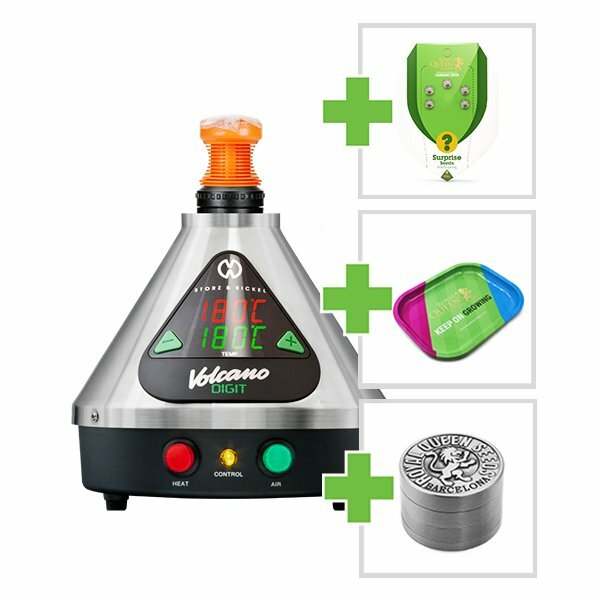 When you order the Volcano Digit vaporizer at Royal Queen Seeds, we will throw in 5 free seeds, an embossed RQS 4-part metal grinder with our logo, as well as a colourful RQS metal rolling tray! The 4-part metal grinder is made from zinc and includes a filter and kief-catcher. The RQS rolling tray is made from sturdy metal and features a colour print with the Royal Queen Seeds logo. This device includes a 100-watt convection heater, and the capacity for dry herb or concentrates. Plus, get a metal embossed grinder, a metal rolling tray and 5 free seeds as part of our complete kit! Spannabis 2019: Royal Queen Seeds wins Best Seedbank!